Chicken has been one of the favorite in my household ever since I have begun to experiment with various kinds of chicken recipes. I still remember the first time I made Sri Lankan Chicken Curry; that dates back to a regular Sunday afternoon; March 9, 2014. 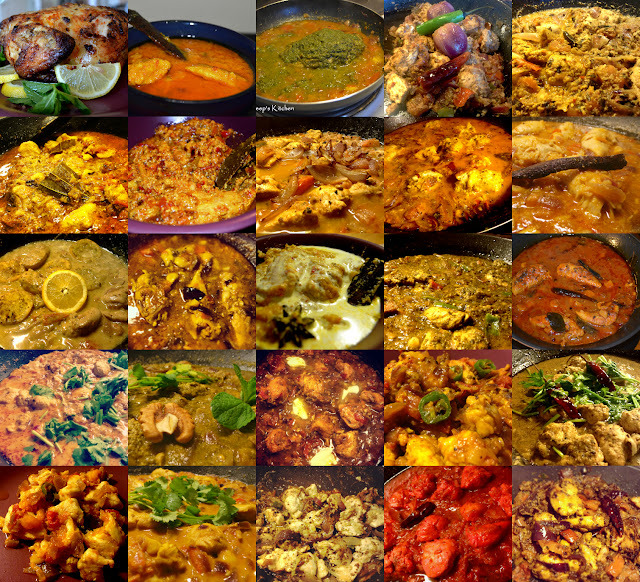 At the beginning of this journey, I never imagined I would get to a whooping 100 different kinds of recipes just with chicken as it was just a out of the ordinary experiment. I haven't stopped ever since and it's just today I have completed cooking my 100th chicken recipe; Peshawari chicken Curry. The journey went about with chicken curries, marinated chicken, non-marinated chicken, grilled chicken, chicken stir fries, chicken biryanis; you name it !! I haven't found the time to write all the recipes so will keep on updating this post with the recipe links which are missing. Till then, keep cooking, keep enjoying and leaving your valuable feedback which always means a lot. If you loved this post, please do leave a comment and/or feedback and share the pictures with me if you try any of my recipes; it means a lot to me. Don't forget to join me on my Facebook page for regular recipe updates.